MEN: 2 servings of protein at meals and 1 serving at snacks. Dietary protein. It’s one of the most important topics when it comes to your body and making improvements to it and why it is this week's food skill. Let's keep this as simple as possible. For now, we want you to know that eating moderate amounts of protein, at regular intervals throughout the day, can help promote satiety and in turn help manage hunger, which is a foundational piece of the weight loss puzzle. So how many servings of protein dense foods should you have at meals and snacks? Your needs will vary depending on body weight, activity level and gender, but let's start with a simple template shown in the image above. 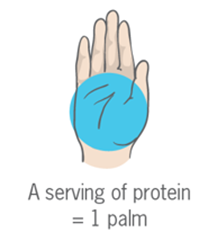 Your hand is proportionate to your body and is a great tool for helping you eat appropriate portions. This week, we encourage you to focus your food tracking in your CorSync app on the protein source and portions at all meals and snacks. By doing this, you will learn if you are eating protein rich foods consistently throughout the day or if your portions are way too big (yes, there is such a thing as overdoing protein too!). Also, as you add protein rich foods, notice how you feel. Are you less hungry? Are you eating less overall? Below is a list of animal and plant based proteins that count as your protein rich food. Don't forget your week 2 food skill of eating slower and using a hunger scale! These are foundational skills that we want you to practice throughout your adventure! This should be adventurous! Last week, your skill was to focus on filling your blue and grey buckets. This week, we want you to focus on filling your orange bucket minutes. Since we are in week 3 of your adventure, you are most likely moving more consistently and feeling more fit! We want you to begin adding in activity that challenges you and your heart. As you recall from the table last week, when we consistently spend some time exercising at a higher heart rate zone, it will encourage these benefits: increased calorie burn, during and after exercise (which is important for weight loss!) So what do you need to do differently to fill your orange bucket? We still want you to strive to reach your grey and blue zone goals. Then, consider doing your favorite exercise in a way where you push yourself a bit more or consider trying a new activity. High intensity interval training, intervals, intense group fitness classes and the 3 workouts of the week below are all adventurous options! We hope you view filling your orange bucket as an adventure that will make you stronger and move you closer to your weight loss goal. Your weekly goal for time in orange is 30 minutes! You got this! If you are short on time, get your Tabata on! Tabata is a specific way to do High Intensity Interval training. This training protocol involves performing a particular exercise (or exercises) at high intensity for 20 seconds followed by 10 seconds of rest. This is repeated 8 times for a total training time of 4 minutes! If you want to string multiple tabatas together for a longer workout, go ahead. You may need to dial the intensity down a notch though to get through it, at least until your able. Your workouts this week include Apolo Ohno Tabata, a Wholata Tabata, and Twist and Shout.